This disposable sub ohm tank is going to have you jumping for joy with its effortless installation and way of making your routine more streamlined than ever before. As you see just how it is able to make your vaping routine so trouble free and quick, you will become someone who repurchases these time and time again. One of the really great things about these disposable sub tanks is that they work as well as your typical tank but can be disposed of instead of switching out coils. Geek Vape creates some truly innovative products that will be able to hold their own in any collection and bring a level of advanced usability into the mix. 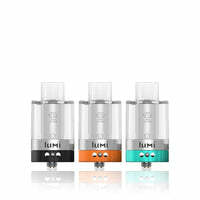 The Lumi Disposable Sub Ohm Tank has a 24mm base diameter, 0.3ohm rating, made for use between 30 to 45W and has a 4ml juice capacity.